Over/Under: Under 142.5 at 1.90 Bet Now! 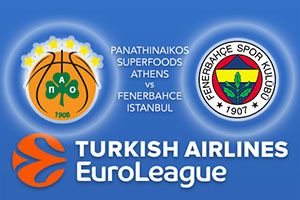 We are all set for an excellent evening of basketball action on Thursday night with Game 2 of the Euroleague Playoffs getting underway. There isn’t much time for teams to catch their breath this week and the players roar back into action after having played on Tuesday night. That was a spectacular game of basketball and it will be interesting to see if that game has any impact on the two teams who square off once again in Athens this midweek. Heading into the opening game of this best of five series, we noted that Panathinaikos don’t lose too many games at home but they did on Tuesday night. This was a crushing blow to the Greek side and the fact that they were 16 points ahead in the third quarter will only cause them more anguish when it comes to looking back on what might have been. Few would have predicted what would follow at that point but an 8-40 scoring run came out of the blue with Bogdan Bogdanovic having a night to remember. Bogdanovic enjoyed a career high by grabbing 23 points, 5 rebounds, 4 assists, 3 blocks and he ended the evening with a performance index rating of 35. Given the turnaround, it is no surprise to see figures like this but there were also massive showings from players like Niko Kalinic who provided 16 points in the win while Bobby Dixon offered 13 points in the win. It was a tough night for Panathinaikos and the 16 points provided by KC Rivers and the 14 points from Mike James weren’t enough to see the Greek side home with a win and there is now a considerable level of pressure on Panathinaikos heading into this match. Before the game on Tuesday, the two previous clashes between these sides this season had fallen in the favour of the home team but that all changed this week. You have to think that the hosts will get back on track in this clash and you can back Panathinaikos Superfoods Athens at -4, which is provided at odds of 1.90. When it comes to the Over/Under market, go UNDER 142.5 which you can find at odds of 1.90. Bet Now!